Traditionally, these are called Pavlovas after the Russian ballerina. I think you should call them fro-poes — short for frozen pavlovas! That’s what they make me think of actually — instead of berries you have gorgeous ice cream! How about the Brandon Blast? Sort of looks like a little mountain. 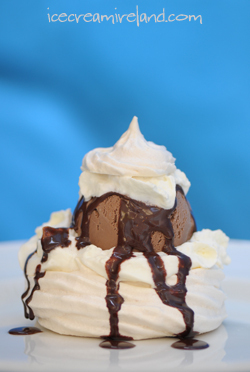 Well, my straight ahead response is that it’s an Ice Cream Pavlova, but if you want something a little more poetic, the meringue is light as a cloud, so… Sundae in the Clouds? Cloud Nine Sundae? Joan’s right, it has to be a mountain, preferably a snowcapped one. Hows about a Montblanc? a bit corny,but nicely obvious. Too bad I’m not there to help with the tasting! I like the Mount Brandon angle. What about calling it a ( Finbarr/ Lichtenberg/ Light-Mountain) -“Finn Bar”- or -“Fionn Bar”-? Have you tried out the lemon mirangue pie version? Pavlova, Lemon ice cream? topped with whipped cream and maybe cookie crumbs? Looking forward to the Dingle Food festival this weekend! How about calling your new dessert Meringutangtastic…just popped into my head…a little long perhaps! I don’t know, with it’s pointy top, it looks like Cruach Mhárthain. Martin in Clouds? By the way, we did get into the shop (An Daingean) several times, last week while in town (although now back in DC, and already missing the fabulous coffee and ice cream!). The folks in the shop we so lovely, (especially Sara) and we told everyone we met to stop in (and who could resist with the glorious weather last week?). Stopping in for coffee was the last thing we did, meeting our friend Sandra, before driving to the airport. to me they look like little winter hats — you know with a brim and a pompom…but i don’t have a good NAME for it! I think there gorgeous! Just like little works of art! What about “Snowy Peaks”? Or “Sky High Meringues”? why not “nid d’amour” (love nest in French ?) or “nuage d’ange” (angel cloud) ? No more suggestions for a name, just wanted to say they look gorgeous. I’m thinking about “Iceberg” or if you mean that the name of a mountain could be ok, why not “Everest” or “Fuji Yama” (because Mont Blanc is a cream, mostly vanilla or chocolate) with my preference for the last one. Mmmmm!! looks so delicious! the one with chocolate sauce is just mouth watering big time. Looks like an Easter nest complete with Easter egg to me. So why not call it “(Strawberry, chocolat . etc. etc. ) nest egg”? 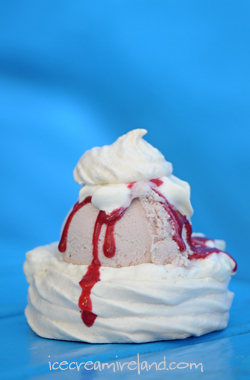 You could call them Snowmans Suprise and if people asked what the suprise was then you could have a little spoonfull of coulis on the meringue before placing the scoop of ice cream on top.